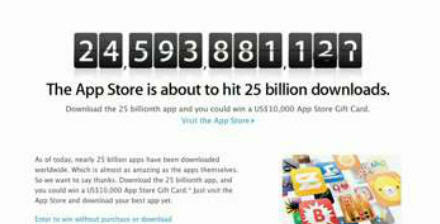 Apple launched its countdown to its 25 billionth app download from the App Store. Looks like we're not that far away just yet. The company is giving away a $10,000 gift card to spend in the App Store. What will you buy if you won? You can fill out an online form to be entered to win. The winner must agree to publicity, such as sharing your name, photo and some of your App Store picks with the Apple community. And sure, why not. Its a $10,000 spending spree!